Ingredients (serving 4): Rice, 3 cups. Green lentil” 1 ½ . Onion, 1 big, thinly sliced. 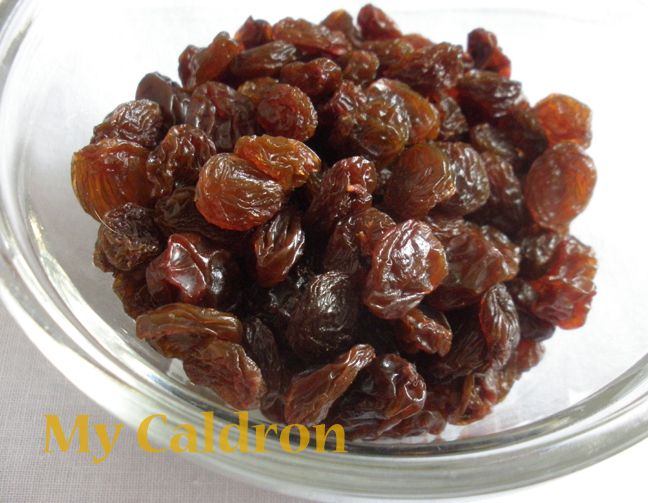 Dried seedless raisin ½ cup, washed and dried. Oil: 4-5 tbsp. Turmeric, ¼ tbsp. Ground saffron, 2 teaspoon (1 soaked in 1 tbsp. of hot water for half an hour) salt, pepper and water as needed. Method: 1. 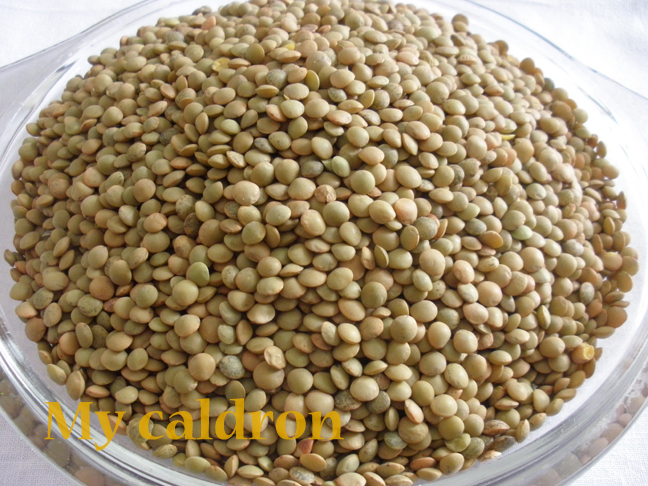 Pick over the lentil, wash and cook in a small pot over medium heat with fresh water and pinch of salt until done but not too soft – this is a key factor: you don’t want mushy lentils. Adjust the cooking time and water so at the end of the cooking process you would not have too much water left. However, if you do get some left, simply drain your lentil, set aside, and keep the water for cooking your rice. 3. In a frying pan stir-fry onion in 2 tbsp. of hot oil until golden (this is your piaz-daagh). Add turmeric and a pinch of salt and pepper and stir for a minute or two. Lastly, add raisins and fry only for a few seconds, just enough to bring out the taste – note that frying raisins for too long make them puffy and too dark and you don’t want that. 4. 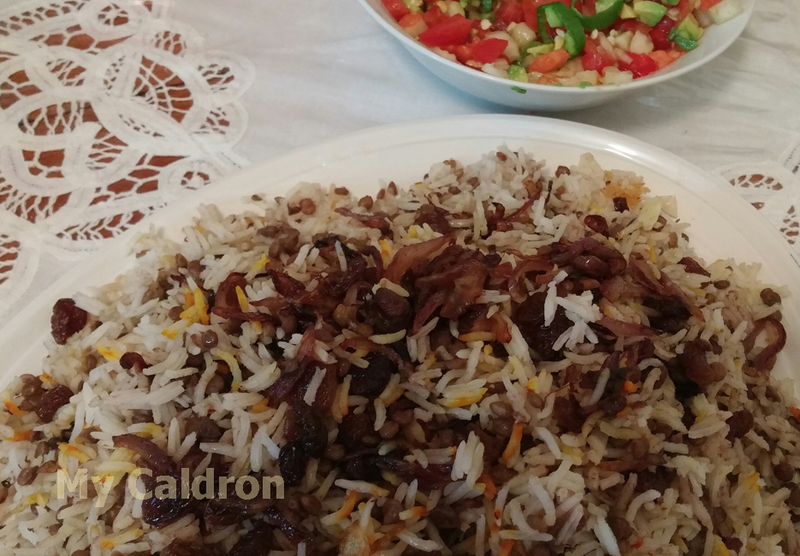 When the mixed lentil rice is ready to be served, use a large platter and mix it well with 80% of the contents of the pan. 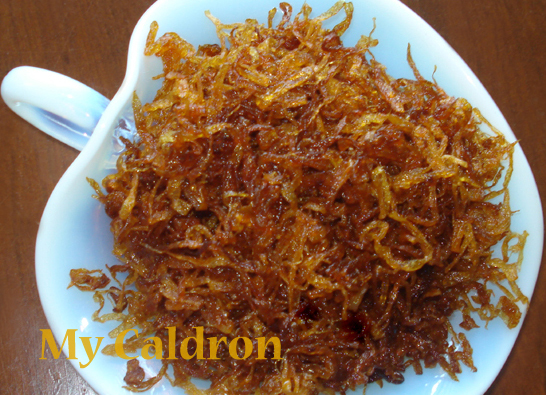 Mix the remaining 20% with soaked saffron and use as garnish on the top of the platter. All tastes colors and savory bits of this mix is fairly distributed in the platter, and the very top is only slightly richer. دست شما درد نکنه. من کوفته‌های ریز مثل کلم پلو هم درست می‌کنم و با عدس میدم لای پلو. برای موادش هم کشمش و پیاز داغ و خرمای ریز کردهٔ سرخ شده و مغز گردوی سرخ شده میریزم. اینطوری هم بد نمی‌شه. یک سوال هم داشتم. پیاز داغ رو چطوری اون رنگی‌ در آوردین؟ مال من همیشه یا شل و بی‌ رنگ می‌شه یا اگر بگذارم که خشک بشه از این خیلی‌ تیره تر می‌شه. حدس میزنم به حرارتش ربط داره. می‌شه اینو توضیح بدین لطفا؟ خیلی‌ ممنون.